I want to send a big thank you to Penny, Dana, and Michelle this week for constantly liking and sharing my Facebook posts. I see you and appreciate you. If you find BlogAid helpful, please do let me know with shares and likes anywhere you see my posts. It really does help me out and is a great way to support all the free info I make available that helps you be a successful site owner. I hope you’ll join me live this Friday, April 21 for a fun, non-geek-speak chat on what’s involved with converting your site to HTTPS and about SSL certificates. Plus, we’ll cover the differences in free way of doing it and actually converting your site. My updated Ultimate HTTPS Pre Conversion Checklist is my gift to you when you register for the free webinar too. It has the latest on all the site areas that can be affected during a conversion and the info you’ll want to gather to make the process go smoothly. I hope you’ve seen my post from Monday about the radical difference in hiring a pro to help with your HTTPS site conversion and going the free route with your host. These are not even close to equivalent services. If all you know to do is compare by price, then you owe it to yourself to see what you don’t get for free. The main point of this post is to help you make an educated decision based on facts, not just price. If you’re in site owner or blogger groups, I hope you’ll share this with them. Hopefully it will help back up what you’re trying to tell them about it. If you’re a designer or have a site maintenance business for your clients, hopefully this will help them understand why this service is worth paying for. Check out Level 3 Webmaster Training courses if you want to learn how to provide this service for your clients. I’m delighted to get to spend some live time with my webmaster members this week. Tuesday we’ll be doing a live workshop on how to perform a site audit. I’ll be sharing the exact same steps I take during an audit and everybody gets a copy of the checklist I use. They’ll see real world examples of the issues I find and what to look for. Then next week we’ll be going over the common performance and security issues and recommended ways for fixing them. Plus this Friday I get to spend time in a live chat via Zoom with Level 6 webmasters. We do this about every month. It’s just one of the perks of Level 6 membership. It’s great for everyone to get some facetime with each other and pool our resources, as everyone has a specialty. Speaking of pooling our resources, in May I’ll be running a live challenge for all of us to do PHP compatibility checks and see if we have super duper old plugins. This is in an effort to help all of us make the switch to supported versions of PHP and to get security issues off our sites. In doing these checks during site audits, I’ve found plugins that have not been updated in 7 years and they have serious security issues. I’m also checking out plugins and such to help us find old plugins. So, if we all pool our resources, we can make a list of them along with recommendations for plugins to switch to that are currently supported. It will save all of us hours and hours of research, not to mention the trial and error. It takes a village and my webmasters will be in on this too. So, look for announcements toward the end of month for when that challenge will start. BlogAid News subscribers will be the first to know. And it’s likely I’ll do a follow up webinar just for them too. On his one year anniversary, my colleague Bob Dunn re-shared his post on why he stopped offering WordPress training. Bob and I have had similar journeys with it in that we both had video libraries. But he did a lot of live workshops for beginners and taught Genesis and such too. I recall watching him begin to shut things down in the last few years, including making his WP video library free for a while. But like me, he finally had to close it because, one, there’s no money in keeping a library updated anymore, especially with the radically fast pace of change. And two, because folks who take the courses also expect support for when their site breaks. Neither of us are in the on-demand site fix-it business. We like to teach. I hope you’ll read his post from last year about his journey and check out what he’s doing now, as Bob is still a super rich resource in our community, especially for all things Woocommerce. I’m also looking forward to having a live chat with him soon about the direction I’m taking BlogAid. As y’all know, I’ve had to radically pivot the business last summer for the changing needs of my audience and clients. And I’m still in that process of developing new offers that are more suitable for my more mature site owner folks as well as shortening the learning curve for newer site owners. I look forward to talking those changes over with Bob soon. There were at least a dozen super SEO posts published this last week. I’ve culled out what I believe to be the most useful ones for you here. Last week Yoast rolled out yet another feature update in version 4.6. This time it is to help you link to what he calls your cornerstone content. Darren Rowse of ProBlogger calls this your pillar content. And Mike Allton of The Social Media Hat encourages writing epic content that is a definitive resource for this. Basically, it’s a super important page or post that you want to link to over and over in other pages and posts. Internal links count big time with your SEO, and is one of the main points we’ve been covering in my SEO Workshop. In this plugin update, Yoast gives you the opportunity to mark a post or page as cornerstone content so you can find it more easily when creating a link to it. And in the premium version, he gives you deeper analysis tools for it too. I haven’t talked much about Google’s AMP project in over a year. That’s because me and most of my clients can’t really make any use of it simply because it strips out our money makers. But, one of my clients wants me to check it out anew for her site, so I asked her to read this post on Confluent Forms about their take on it. For the most part, AMP’s restrictions require you to nearly run two versions of your site. Remember the old m. versions and WPTouch? It’s sort of like that. To me, responsive themes pretty much take care of mobile visitors and I still don’t see the need to strip down to AMP’s level of display. But, if you have a news type site and you want to strive for the extra visibility perks from AMP, then maybe you’ll want to revisit jumping through the hoops required to make it happen. But do read this post first. Just know that all the stripping down and reformatting is why I gave up on Facebook’s Featured Articles too. And no, it and AMP aren’t compatible. So it’s like running 3 versions of your site. No thanks. In one of their famous, or maybe I should say infamous Here’s Why skits, Eric Enge and Mark Traphagen tell us all about the new feature of displaying YouTube video descriptions in Google’s Featured Snippets. I do a lot of tutorial videos on the BlogAid YouTube Channel and you better believe that I’m going to do some better formatting on the descriptions now too. A couple of my posts have hit Google’s Featured Snippets and it really does bring a lot more traffic. And since Google loves featuring YouTube videos anyway, this could be a big new traffic source for me. And I hope it encourages you to find a way to use more video in your content marketing as well. They don’t have to be talking head videos. None of my tutorial ones are and they bring me a lot of traffic. One of the things we are covering over and over and over in the current SEO Workshop is how much SEO has changed and to upgrade from tactics used in 2012 because they just don’t work anymore. This post from Eric Enge is a good overview of how Google’s AI and Machine Learning are changing everything about search. Note his emphasis on creating quality content. Google is starting to read blog posts like humans. Authority on topic is in. Michael Cottam has a super post on the Moz blog all about XML Sitemaps and tips. You’ll want to read the post for yourself, but I’ll summarize a bit of it here. An XML sitemap is a hierarchical listing of all the content on your site and it’s specifically formatted for bots to easily read. One of the most misunderstood things about all of this is the difference in Google crawling a post or page and Google indexing it. Google will attempt to crawl all of the pages/posts you have listed in your XML sitemap. However, Google will only index the content it deems worthy to display in search results. Whatever Google has not indexed is content you want to give another look, or remove from your sitemap. Another issue Michael brings to the forefront in this post is how we tease and confuse Googlebots. First we list a page/post in the sitemap and tell it to go crawl. Then we block that page/post in robots.txt or via other methods. READ: Control How Google Crawls and Indexes Your Site Pages for more on how to stop confusing Google and tips on easy ways to remove posts/pages from your sitemap too. 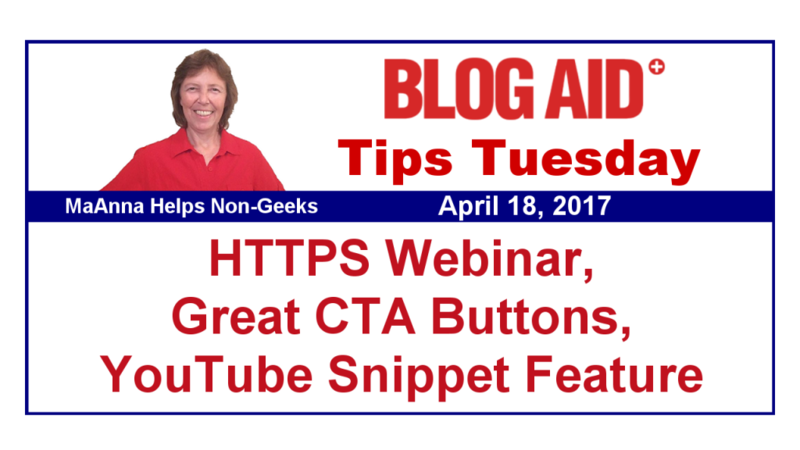 Do you use CTA (Call To Action) buttons on your site? What word is on that button? My friend and fellow webmaster Ingrid Moyle has a super post on creating more persuasive buttons that make folks want to click. Well worth the read. In 2013 I did a lot of interviews and posts about security regarding the Internet of Things (IoT). All of them can be used as fodder by hackers in a DDoS attack. It’s up to all of us to secure every device we have connected to the internet so it can’t be used against others. The folks at WordFence have created a free online checker to see if your router is vulnerable. And be sure you are keeping all of your other devices up to date, just like you do with your site and theme and plugins. Lack of updates is the #1 way hackers break in. Don’t make it easy for them!! Aways interesting stuff you give us…thanks, MaAnna. Happy to be helpful, Christian! MaAnna, I sincerely want to thank you for your post regarding the possible vulnerability in my homes router!!! It blows me away to think how cautious and diligent I am in protecting everything I own (including my WordPress sites) and I never though to do so for a major gateway into my home through my router. Again I thank you for sharing this info. You’re most welcome. Most folks think taking time to do updates and such are a pain. The real pain is in not doing it!!! I miss your skinnies Ana!!!! But totally understand about priorities!!! Glad to keep sharing what I find that’s useful for all of us.